*With approved credit. Estimated monthly payment based on $2,340 down, 72 months at 5.9% APR. KBB.com 10 Best SUVs Under $25,000. Delivers 26 Highway MPG and 19 City MPG! This Jeep Cherokee boasts a Regular Unleaded V-6 3.2 L/198 engine powering this Automatic transmission. TRANSMISSION: 9-SPEED 948TE AUTOMATIC 2 SPEED PTU -inc: Active Drive II Badge, Jeep Active Drive II, Hill Descent Control, Off Road Suspension, TRAILER TOW GROUP -inc: 7 & 4 Pin Wiring Harness, Trailer Tow Wiring Harness, Class III Receiver Hitch, Full Size Spare Tire, TONNEAU COVER. 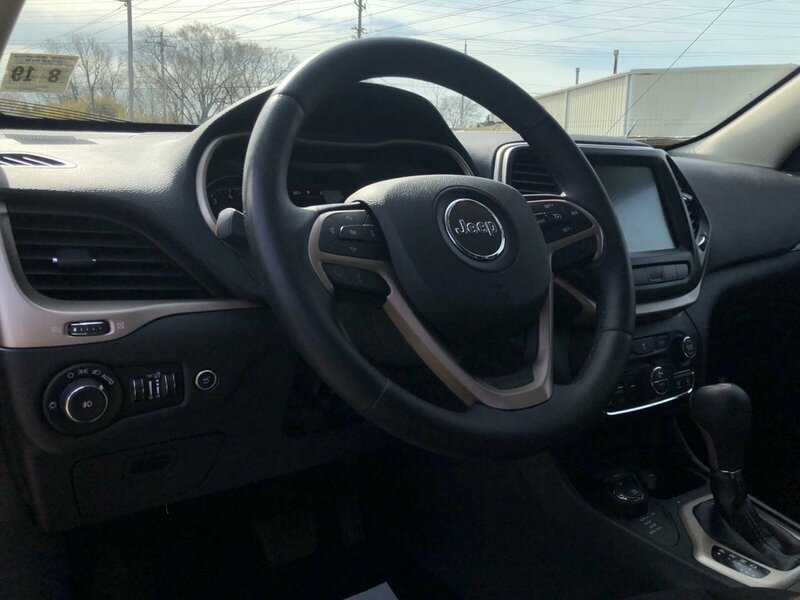 QUICK ORDER PACKAGE 27J -inc: Engine: 3.2L V6 24V VVT, Transmission: 9-Speed 948TE Automatic 2 Speed PTU , RADIO: UCONNECT 8.4A AM/FM/BT/ACCESS -inc: Nav Ready! See Dealer For Details, GPS Antenna Input, Uconnect Access (subscription required), 8.4" Touch Screen Display, For Details Go To DriveUconnect.com, Integrated Voice Command w/Bluetooth, PARKVIEW REAR BACK-UP CAMERA, OFF ROAD SUSPENSION, FULL SIZE SPARE TIRE, ENGINE: 3.2L V6 24V VVT -inc: Pentastar, 3.25 Axle Ratio, Dual Bright Exhaust Tips, ECO GREEN PEARLCOAT, COMFORT/CONVENIENCE GROUP -inc: Premium Air Filter, For More Info Call 800-643-2112, Power Liftgate, ParkView Rear Back-Up Camera, Passive Entry/Keyless Go, SIRIUSXM Satellite Radio (subscription required), Tonneau Cover, Rear View Auto Dim Mirror w/Microphone, Universal Garage Door Opener, Automatic Headlamps, Air Conditioning ATC w/Dual Zone Control, Remote Start System, Power 4-Way Driver Lumbar Adjust, Cargo Net, Remote Proximity Keyless Entry, Power 8-Way Driver Seat, Humidity Sensor, Security Alarm, COLD WEATHER GROUP -inc: Power Heated Mirrors, Heated Front Seats, Exterior Mirrors w/Heating Element, Windshield Wiper De-Icer, All-Season Floor Mats, Heated Steering Wheel, BLACK, CLOTH LOW-BACK BUCKET SEATS. As reported by KBB.com: If you want Jeep off-road capabilities in your small SUV and are willing to sacrifice a little room to get them, the Cherokee is for you.